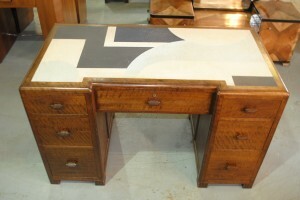 An original art deco Harrods desk with a combination of walnut and burl walnut veneer. 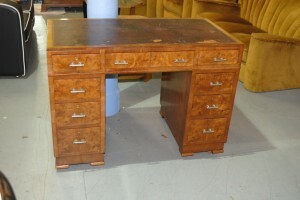 Currently in good original condition but can be restored if preferred and desk leather replaced. 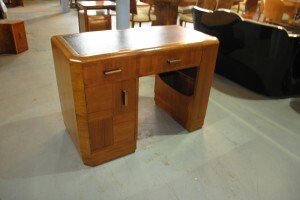 This desk can be placed anywhere in a room as it looks lovely from all 4 sides which is an unusual feature and denotes good quality and design. The top centre drawer has the Harrods label inside and the desk sits on four castors for ease of moving. 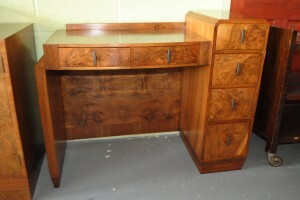 Original Art Deco Walnut Desk with black tooled Leather Top and fantastic from all four sides! 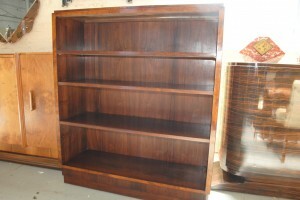 Nice walnut and teak veneered ladies desk with black and gold tooled leather top. Discreet storage space in knee hole ,2 drawers and a cupboard. The desk is finished on all sides so can sit anywhere. 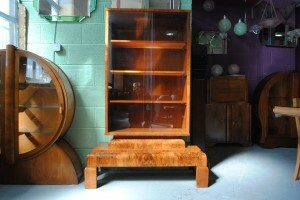 A Stunning original art deco figured walnut display cabinet with a very unusual and beautiful base and bevelled glass sliding doors.Great veneers in great condition.